I decided to close my ‘NFP short position’ before few minutes! Support at 1.1135/40 looks to strong for me and I will not wait any more. Is there possibility to reach my predicted target at 1.1080? Possible, but I will not put in danger my gain furder. The pair is still bearish, but as I see it, turnover is possible here as well. With the closing of my ‘NFP position’ I ended up showing how I trade in the market. You can see in the 4 steps how and why I have decided to open this trade, how, why and when I have protect my position and finaly, why I have decided to closed this trade here. I have started in Friday afternoon, end up on Monday afternoon. 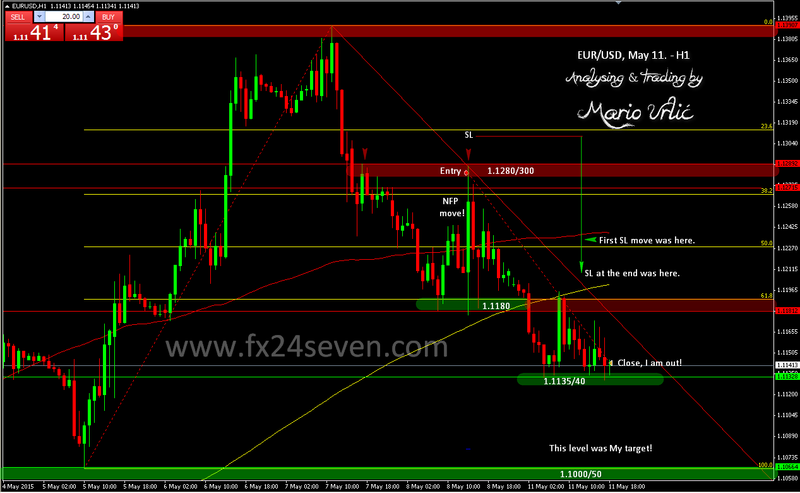 Two working days trade, which had started with RR of 1:10 and closed up with RR 1:7 and 139 pips gain. This was trade with very low risk and great technical setup at the begining, after wich I have monitoring the situation and adjusting parameters during the day, finaly closed with nice, not to big gain. This is trade and this is how real trade looks like in the market. I am happy at the end and I’m going to wait another chance now. Svaka čast legendo, odličan trejd. what you use MA in that chart Mario ? SMA or EMA ? whats periode ? SMA, 100 (red) and 200 (yellow).